Having chased off all of Pattaya’s street vendors, the city’s top lawyer is now taking aim at motorbike taxis and rentals camped out on public roads and sidewalks. Legal Department chief Sretapol Boonsawat and city hall regulatory officers toured Beach Road Oct. 6, finding their ban on street vendors occupying public sidewalks was holding up. 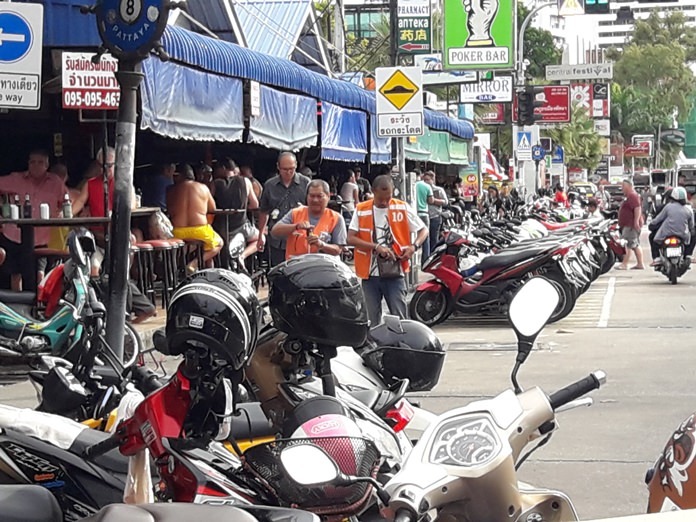 Sretapol said the next step will come this month as authorities move against motorbike taxis sitting on sidewalks and bike-rental agents who park their vehicles on the street, taking up valuable parking and traffic lanes. The exact strategy was not set yet, he said, but any action also will apply to Jomtien Beach.